Please, please God, don’t let the world blow up before Sunday night. Because Sunday night at 9 pm, I get to see choreographer Rod Alexander‘s brilliant dance number, “The Birth of the Blues” from THE BEST THINGS IN LIFE ARE FREE (20th Century-Fox 1956), at CINECON Classic Film Festival — in a new 35mm print, splashed in CinemaScope across the Egyptian Theatre’s huge screen. The film stars that great song-and-dance man, Ernest Borgnine. But beyond Ernie, it contains a glorious, top-end eight-minute dance number choreographed by Rod Alexander, having just completed dance assignment on CAROUSEL. Sequence features Jacques d’Amboise, at turns tender and searing, dancing in truly majestic condition. The blonde vixen is Sheree North. Who knew this woman could dance so well? Her simple sultry dance walk, to my eye, gives Cyd Charisse and Leslie Caron a run for their money. Alexander’s “Birth”sequence reflects the influence of Jack Cole … in 1955 Cole had just killed in a string of Fox Technicolor films (ON THE RIVIERA, GENTLEMEN PREFER BLONDES, THE I DON’T CARE GIRL) and was at the peak of his powers. He cast a huge shadow. 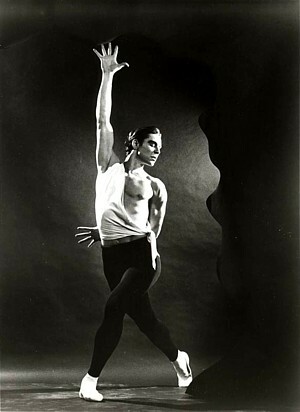 “Birth” choreographer Rod Alexander was a Jack Cole dancer, participating in Cole’s films and night club act. “Birth” has its own unique qualities: marvelous production design, superb story telling through movement, a fluid roving camera, and a sizzling but tasteful pas de deux for d’Amboise and North, both giving great performances. arts·meme friend Larry Billman, chatted with d’Amboise when the former New York City Ballet principal dancer recently visited Southern California. I see influences from Gene Kelly, and even a bit of Astaire/Pan. I see a very young Bobby Banas in the jail cell!! !